Built by Jaguar Special Vehicle Operations and inspired by the limited edition Project 7, we get our first go in the new 562bhp Jaguar F-TYPE SVR, the fastest, most powerful sports car from Jaguar since the XJ220. Let me stop you right there: this is not Jaguar’s answer to the Porsche 911 GT3. True, the new F-TYPE SVR is the fastest production example yet of Jaguar’s halo sports car given that it clocks 200mph (320kph) at full pelt. It’s also the fastest road-going Jaguar since the XJ220, revised bodywork and a drivetrain from the limited edition Project 7 ensuring that. 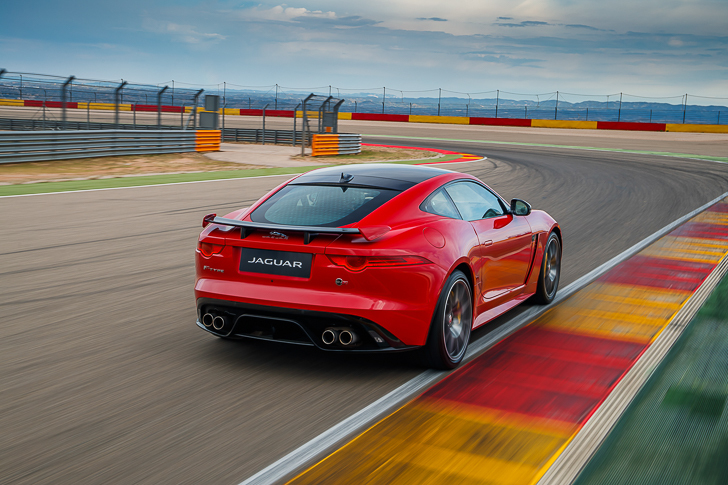 The F-TYPE SVR is not, however, just a track-day weapon, a point that’s made clear during our first taster in Aragon, Spain. At just a shade under $160K, the coupe is cheaper for starters, slotting in below the $205K Porsche 911 Turbo and $230K Aston Martin V12 Vantage S it’s more likely to rival. Also, forget bucket seats, plastic windows and roll cages. 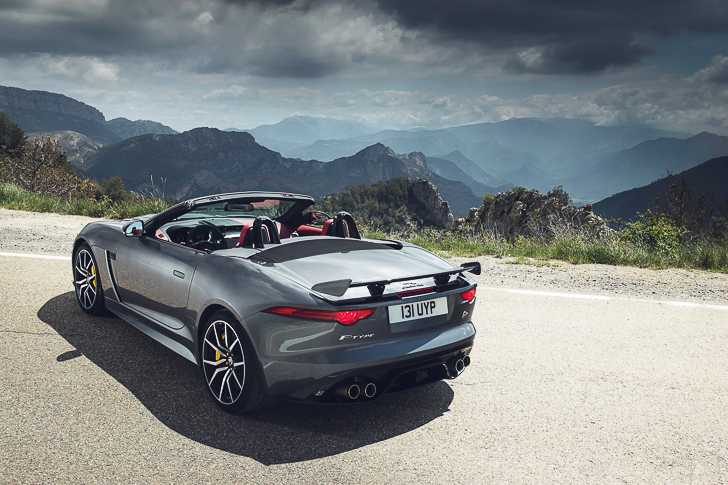 The new SVR was essentially designed by JLR’s Special Vehicle Operations to take the F-TYPE R’s design, handling, performance and soundtrack to ‘a whole new level’, but as a ‘200mph all-weather supercar’, it still needs the everyday capabilities of a Jaguar. And I’ll come back to that. 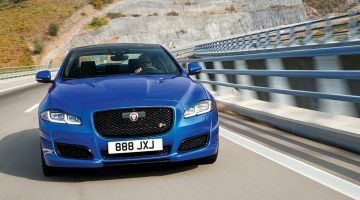 How has the F-TYPE SVR been developed? First, makin’ it lighter, stiffer, louder, faster. It may sound like a bad lyric from a Kanye West rip off, but there’s a considerable amount of tinkering needed to lift any performance car over that 200mph/320kph threshold. Stick Project 7’s supercharged V8 engine into a regular F-TYPE R for instance and chances are it’ll run out of puff at the 190mph/305kph mark. Consequently the ‘R’ base has received a more aggressive front bumper with larger air intakes, a front splitter, new underbody and a carbon fibre active rear wing, all designed to increase aero efficiency and reduce drag. 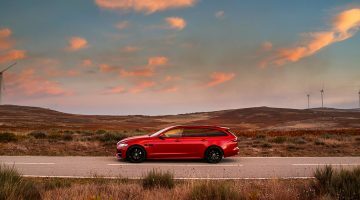 Neither Aragon’s roads nor the Motorland Speedway’s lengthy straights are quite long enough for us to demonstrate this, but we’re happy to take Jaguar’s word, given the thunderous turns of speed of which this engine is capable. How does the big cat handle? Unlike Project 7, 562bhp is sent to all four wheels for not only a spirited getaway, but also a more neutral balance and greater precision through the corners. Spring rates remain unchanged, although both the dampers and anti-roll bars are new, the latter firmer at the rear in an effort to improve turn-in response. Impressively so it has to be said. Revised torque vectoring (which brakes the inner wheels to mitigate understeer) plus little difference in roll stiffness through the corners means there’s a finer sense of accuracy. Yes, the electronic steering could use slightly more impactful feedback, but the revisions to the setup mean initial bite into the corners is much sharper, a low centre of gravity and solid weight distribution meaning there’s considerably more accuracy to proceedings too. Helpful when you’re tackling one of the most technically, and frankly terrifying, circuits in Europe. Given the revised all-wheel drive setup, there’s little of the rear axle twitchiness we came to expect in the rear-wheel drive R, the neutral balance in the SVR more composed as a result. Put simply, the precision is damn near flawless, and a lot of that comes down to the amount of grip available. Indeed, performance tyres ensure vast reserves of traction and lateral grip: stand hard on the throttle and those wider rear tyres might wiggle a bit, but you’ll need to test your bravery to really get them moving. This more precise manner of handling might seem uncharismatic for the fastest F-TYPE ever, but at the same time, it encourages an enormous amount of faith in the car. Hustle the front end at speed and it’s unlikely to bite, allowing you to exploit that Project 7-inspired potential more thoroughly and jump on the power that much quicker. What’s the performance like of that 562bhp supercharged V8? Whoa boy, does that supercharged engine kick. From standstill, 562bhp delivers much the same smack in the chops as we came to love in the R, with a dash more severity as you pile your way to 100kph in just 3.7 seconds. Throttle response is sharp, and gutsy 516lb ft of torque means power delivery is incredibly visceral across the board. Oh, and then there’s the soundtrack. Jaguar has worked hard to produce a much ‘sharper edge’ through the new titanium exhaust system in the world’s fastest production F-TYPE. Like any furious V8, there’s a sharp roar under start-up that rattles both the windows and your fillings to the core, this subsiding very temporarily into a low rumble before exploding once again in the high revs. It’s a soundtrack that, during our mountain run in the $163K convertible, nearly brought fully grown, hairy-chested men to tears as the snap, crackle and pop of the overrun filled the valleys beneath. The handling may offer a degree more precision, but the engine and its accompanying orchestra are pure anger. And again, I’m reminded of the ‘everyday usability’ at work. The F-TYPE SVR is monstrously quick, absolutely, but it’s difficult to truly feel the impact of that additional 25bhp and 15lb ft, especially given that the SVR has shaved just 25kg over the R. Granted that slightly portly 1705kg kerb weight can be reduced another 25kg if you plump for the optional carbon ceramic brake options (the stopping capabilities of which, by the way, are pretty phenomenal), but it’s still not enough to kid you into thinking the Jaguar is a compromised, track-only performance machine. SVO has done too a good a job for that. So, there’s a degree of dual usability? Very much so. Take the cabin and ride comfort, for instance. 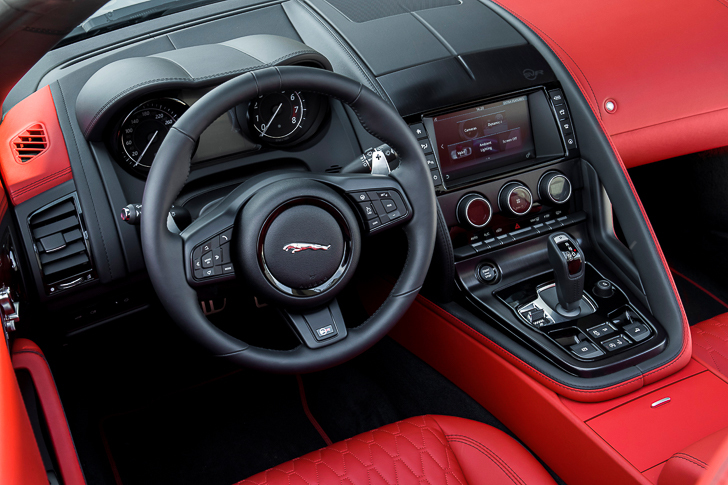 New ‘SVR’-spec sports seats and some rather delicious quilted leather aside, there’s not a huge amount of difference to the F-TYPE R base, not that we’re complaining. The ride comfort though, even with chassis and suspension updates, has been significantly improved versus the overly stiff ride quality of the R, those new sport seats proving as cosseting as they are supportive. It’s really quite remarkable; the cabin offering such a wonderful degree of civility and refinement – much like the handling – that the menacing aero updates would have you believe is impossible. Building on top of an already exceptional base means the F-TYPE SVR was always going to be brilliant, and such is the case here. Though it’s not been utterly transformed, detail improvements across the board mean the newboy is astonishingly agile and a lot more precise through the turns offering a more progressive driving experience as a result, a different prospect to the more lurid-handling rear-wheel drive R. Some might consider that a shame given the performance cachet that SVR badge delivers, but the upside is that it’s a better driver’s car, not to mention that V8 grunt and electrifying sound. You may struggle to truly feel that 25bhp increase but the visceral albeit linear bursts of speed speak for themselves. So, no, we’ll have to wait some time yet before Jaguar produces a Porsche GT3 rival. But as Jaguar’s first ever SVR model, it’s difficult to know what to fault. 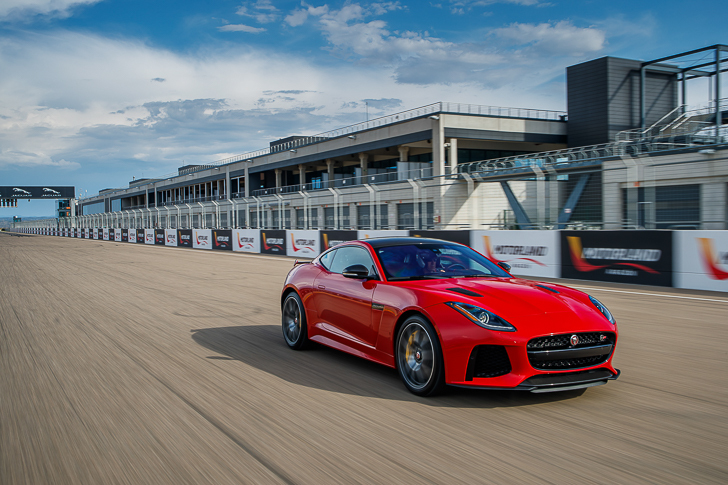 Did you enjoy our F-TYPE SVR test drive? Next Article TEASER. Mercedes-AMG GT R. Goodwood debut?